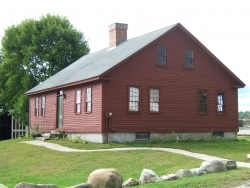 The Morrison House was originally built in 1760 on Rockingham Road and was moved in 1989 by the Historical Society to prevent certain demolition. Now completely restored, the Morrison House is a beautiful example of an 18th century farmhouse as it would have appeared in the mid-19th century. 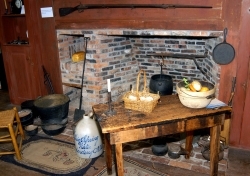 The house serves as a museum for Londonderry artifacts such as early muskets, the running horse weathervane from the Robie House and a fragment of silk from Ocean Born Mary’s wedding dress. Londonderry was a center for the production of flax and linen and there is a display of related items such as a flax wheel, hetchels and a loom. Country furnishings, early hearth iron and even children’s items complete this pre-Civil War rural farmhouse. To further enhance the Morrison House restoration we have added the Parmenter Barn, Clark Blacksmith Shop, and most recently, the Litchfield Carriage Shed. The Morrison House, circa 1760, is one of the few pre-revolutionary homes existing in Londonderry and it is considered to be a landmark. It was originally owned by a well known and respected Londonderry family, the Morrisons, who came to Nutfield (Londonderry) in 1719. Its many original features include a large center chimney fireplace with beehive ovens and brick hearth, Indian shutters, borning room, wide pine floors, nine over six pane windows, feathered clapboards and 18th century door latches.